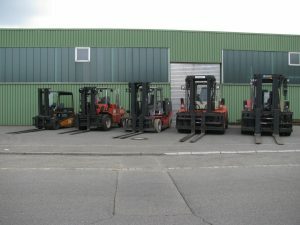 At the present time we do operate 6 different fork-lifts in our fleet. 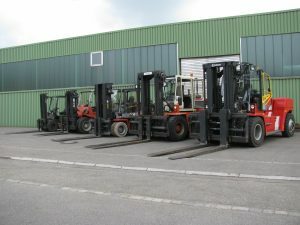 We are able to serve with the following fork-lift trucks. If you wish to rent one of our fork-lifts , you order the one you need and we deliver it in time with one of our lorries to your factory or work place. We also can do the job of moving for you with one of our drivers, one of our fork-lifts and one of our lorries. All weights up to 16 tons we can lift up for you. We take your machines out of lorries or out of containers and deliver them safely and quick to their place you wish them delivered.. These deliveries and collections are our daily work. In connection with our fleet our fork-lifts can get delivered for rent to any place. For works in high level our elevator unit is helping you.